For Salads on the Go! For Salads on the Go! The innovative Salad Blaster allows you to take along your salad and salad dressing all in one container, (but in two different compartments, that&apos;s the trick to keeping it fresh). Take it anywhere, to be used anytime. When you&apos;re ready to eat, just push the Blasters top to release the dressing. Then shake the Salad Blaster to spread the dressing, without opening. It&apos;s the no mess-no fuss way to enjoy a fresh Crispy Salad-On the Go. Never a soggy salad. Just Fill it! Blast it! and Shake it! Then enjoy a great salad! 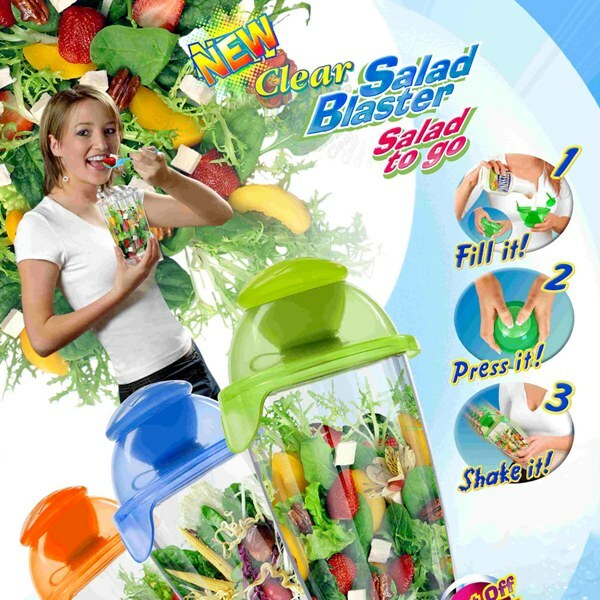 The Salad Blaster is perfect for the office, school and traveling. Salad Blaster is dishwasher safe (top rack only) , 3-cup capacity.